Roosevelt Boulevard at Banks Way. Clarification: An earlier version of this report stated that five new red light cameras will be installed at intersections along Roosevelt Boulevard. City officials have since clarified that funding provided through Pennsylvania's Automated Red Light Enforcement program will be used to complete pedestrian upgrades at the five intersections referenced below, in anticipation of expanded SEPTA Direct Bus service. The funding, part of a series of statewide grants impacting several Philadelphia locations, is not to be confused with proposed legislation install speed cameras and implement fines on Roosevelt Boulevard. 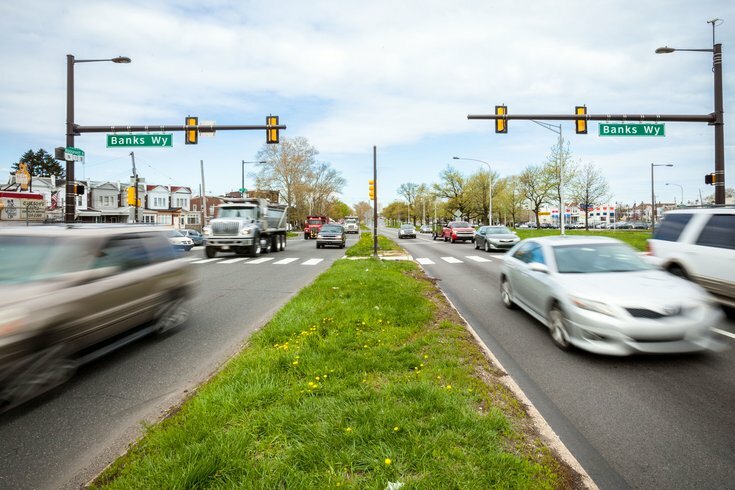 Five busy intersections along Roosevelt Boulevard will soon be receiving pedestrian safety upgrades as a part of a statewide grant program funded by fines collected from red light cameras. A city official in charge of administering Automated Red Light Enforcement funds said the grant will be used for curb and sidewalk repairs, up-to-date street lighting and adjustments for ADA-compliant ramps. The funding comes after SEPTA last year debuted a "Direct Bus" service to better accommodate residents who travel along Roosevelt Boulevard. Grant funding for the five new projects comes from red light violations at 30 intersections already monitored in Philadelphia. The projects were selected by an eight-member committee based on criteria including benefits and effectiveness, cost and local and regional impact.